Every student and every teacher at St. Mary's Academy benefits from charitable contributions. Every student’s curiosity, creativity, and motivation deserves to be explored to its full potential. Your gift to St. Mary’s Academy helps us challenge, support, and expand each student’s vision. It enriches every element of an SMA experience. Most importantly, it offers each student the opportunity to become a powerful agent of change. Giving opportunities provide a critical asset to the daily life at SMA. Give your support today to improve a SMA student’s experience for a lifetime. The family of Florence Swanson, SMA Lower School principal 2015 - 2018 has established a Named Endowment in memory of Florence. Proceeds will benefit tuition assistance for Lower School students. If you would like to make a contribution, please click HERE. The cornerstone of SMA’s annual fundraising effort is the Annual Fund. Each year the fund is allocated to the greatest areas of need at St. Mary’s Academy. SMA strives for 100% participation from its faculty, staff, Board of Trustees, and parents and 10% participation from its alumnae and grandparents. The Community Center has become the hub of our St. Mary’s Academy campus. It features learning and teaching areas, dedicated spaces for Junior Kindergarten through Grade 8 activities, and vital music and drama classrooms for the lower, middle and high school students, plus a lunch room with world-class views! Our parents have welcomed this spacious and dynamic location for meetings, receptions, and as an audience for their students’ performances, and art exhibits. 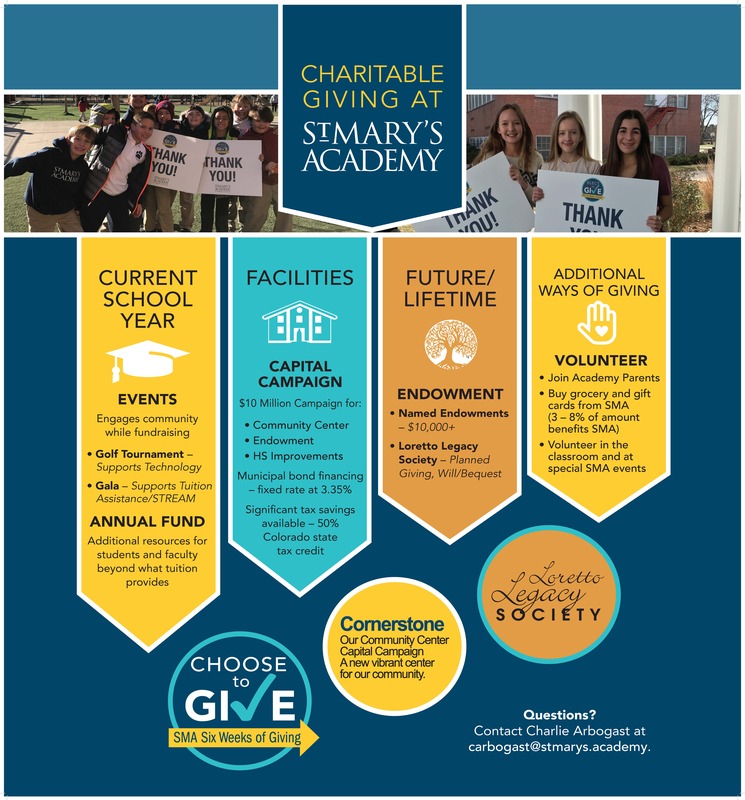 All generous donors who inform SMA of their plans to include St. Mary’s Academy in their will or estate plan will become members of the Loretto Legacy Society. A bequest or life income gift demonstrates a partnership with SMA and its mission to provide an excellent education in the Loretto tradition. Your planned gift, via a trust, annuity, insurance policy or bequest can help ensure SMA’s future, save you tax dollars, help you avoid capital gains taxes, and increase your current income (in some cases). Held in September each year, the funds raised at the Graham Family Golf Tournament benefit technology, performing arts, and endowment at SMA. To support the Golf Tournament you can become a sponsor, or join us as an individual player. Held in April each year, 95% of the funds raised benefit the SMA tuition Assistance Fund and 5% benefit innovative academic programs. To support the Gala, you can become a sponsor, advertise in the catalog, purchase a ticket to attend the Gala and/or donate an item to be auctioned at the event.